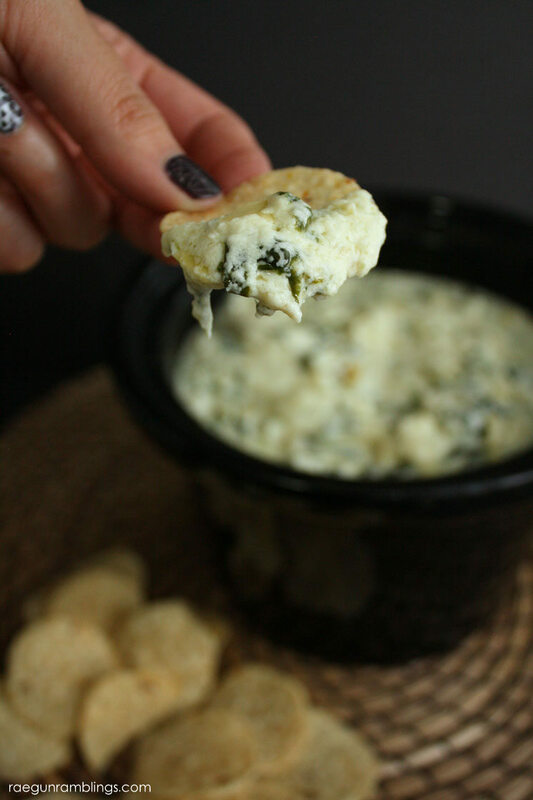 You guys this spinach artichoke dip recipe is pretty much party food/appetizer perfection. Plus it’s SO easy to make! Chips and dip may very well be my favorite food. Seriously I love a good dip with a crunchy vehicle but I’m kinda picky. Not all dips (or chips for that matter) are created equally. But let me tell you this one right here is SO good and it can be made in the crock pot if you want. A quick word about the ingredients. This does not have a spicy flavor or kick to it. But the chilies do add a little something to the overall flavor. I would serve this to the most spice sensitive people without worrying. 20 month old Teddy gobbled this down without a blink. Also you could just use all Parmesan cheese but I do like the depth of flavor you get by using the Romano. Drain off any excess liquid from spinach and chilies. Combine everything in crock pot and allow to heat through (about 40 minutes). 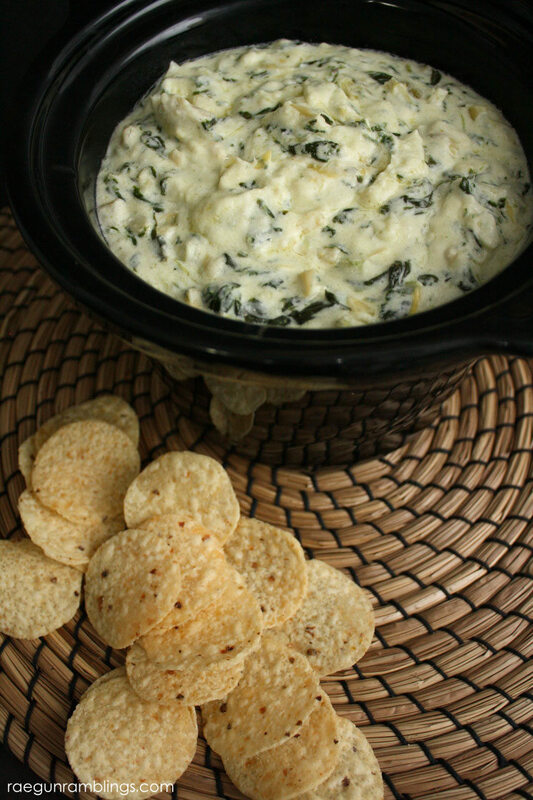 Combine the cheeses, butter, and sour cream in a pot over medium heat until melted and combined. While the cheese is melting drain and chop the artichokes and drain any excess liquid off of the spinach. 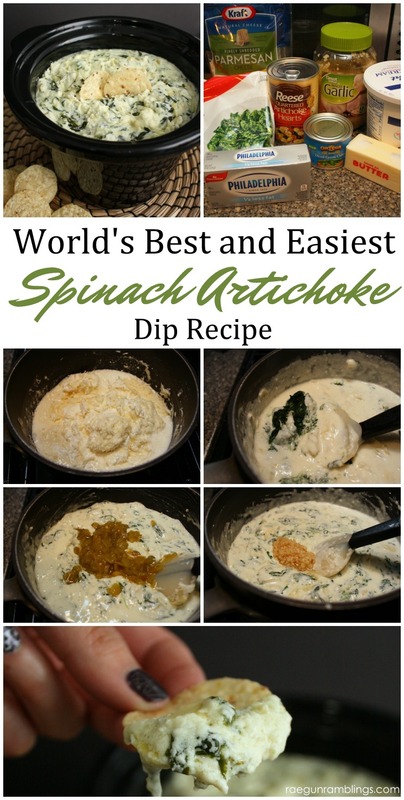 Stir the spinach, artichokes, chilies, and garlic into the cheese. Serve warm. This makes enough to fill a 2 quart crock pot. If you are not in a hurry you could easily make this in a crock pot and save one dish to clean. Just put it on high until the cheese is all melted through and then stir and turn to low or warm. I took this to my husband’s work Christmas party this week and it was devoured fast. We had to leave early to get Teddy down and there was about one big scoop left and I couldn’t help but just take it with instead of leave it haha. I just finished it off as a blog writing snack and seriously reheated in the microwave it was just as good. 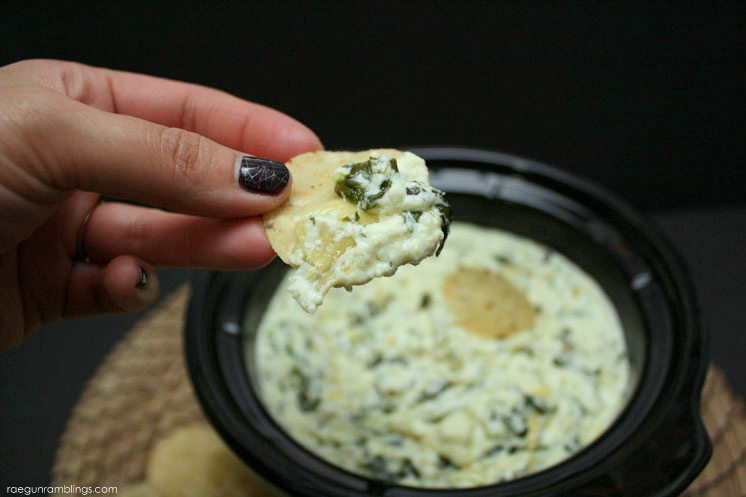 I think I’m in trouble with this spinach artichoke dip recipe it’s just too easy to make and so so good. We might have to pull it back out for New Years Eve if I can resist not making it again for Christmas ha! is there an easy way to print recipes? if you left click, it gives you the option to print. When do you add the jalapenos? Do you drain the jalapenos? just clarified that thanks! They go in with the spinach. I noticed you took a picture of your ingredients and I see a stick of butter but you don’t mention it in the recipe. Do you use any butter? Also the can of chilis says “diced green chilis” I don’t think that is the same thing as jalapenos. I have used those chilis before and they have a good flavor but I don’t think they are jalapenos (but I could be mistaken). I think they are mild green chilis. Nice catch thank you! I did use the butter 1 stick I just updated the post. But I have also made it without the butter and it turns out yummy but not quite as creamy. I might experiment with half the butter next time. Can you use fresh garlic? Would you use the same amount? Looks delicious. Trying it this week for a last minute party. yes definitely you an use fresh garlic and it would be the same amount. Are the artichoke hearts pickled or just packed in water or oil? I thought they always had a vinegar taste to them but I’ve never noticed a tartness to any spinach artichoke dip that I’ve tried but maybe all the other ingredients hide the tart flavor? I’mma making it next weekend, thank you so much. aww I love hearing that. I hope you love it too! Do you drain the canned artichokes? Thanks… I went ahead and made this in the crock pot and added about 1/2 the liquid. It was AWESOME! I put the leftovers in the frig. & It was thick after it cooled, which was not a problem. I had some Chicken thighs, so I took the bone out and put some of the dip in the middle and rolled them up. Cooked them and I now have a new Favorite dip and chicken recipe. Thanks for sharing your recipe. It’s a keeper!! Made this for a party yesterday and had a couple people say it was way too spicy, I’d definitely leave out the jalapenos next time. Otherwise it was delicious, great texture. it definitely depends on the type of peppers. I’ve mostly mild many times and no one has ever noticed any spice at all (including super picky kids that whine about any spice). I wonder if the brand you used runs hotter. I’ve also accidentally bought medium green chiles instead of mild green chiles. That might’ve contributed to the spiciness! I don’t think the can of diced peppers you have in the pic are jalapenos, I looked them up and I believe they are a milder, diced, but very tasty pepper. Generally, most Ortega brand peppers are labeled jalapeno if they are. The others are anaheim or something along those lines. Thanks for looking that up. I’m going to edit it to say chilis but I’m 99% sure I usually use the cans that explicitly say jalapeno even if the time I snapped this photo it might not have been and I’ve made this recipe a lot. I believe some of the readers don’t know the dfference between “jalapenos” and “mild green chiles”.This recipe does NOT call for JALAPENO peppers. If it did, the recipe would say “jalapeno peppers” which it does not. This is for “mild green chiles” in a can. Ortega usually makes canned chiles. Look on your grocery shelf please. Thanks for clarifying that. Not all peppers are created equal, for sure. And Ortega DOES label them so it shouldn’t be a problem to find a pepper that doesn’t make this dip too spicy. Mild green chilis are something most people can handle. 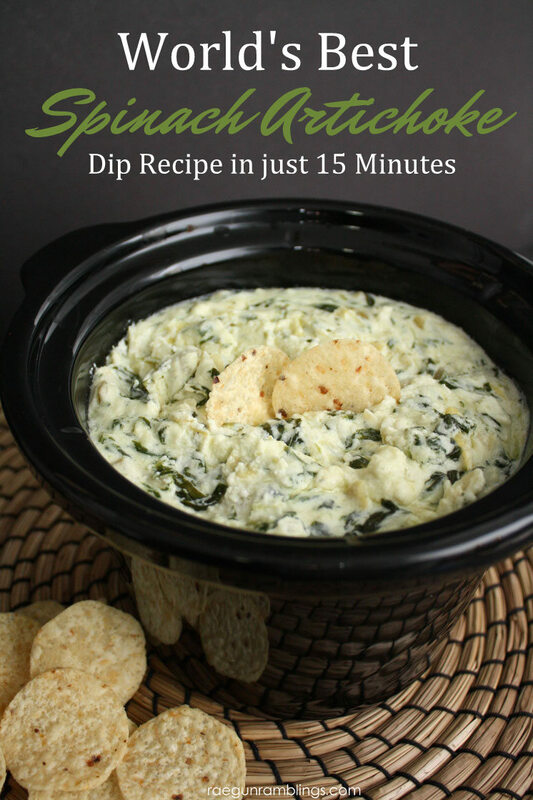 I haven’t made this dip yet, but it’s the recipe I’ve been looking for because it has all the ingredients I want to include and can be made in my small slow cooker. Yippee! Hi! Looks delicious….how long would you leave it in the crockpot on warm? Making it tomorrow for my daughter’s birthday. Thanks!! I plan on making this tomorrow and just want to clarify… you use the canned green chilies that are in the picture correct? I just want to make sure it taste as awesome as everyone has said! What size crock pot did you use and how much does the recipe yield? Do you heat it on high or low for 40 minutes? What kind of crackers are used for the dip? The crackers in the picture look very tasty. Have you tried this with frozen artichoke hearts? I have some in my freezer that I want to use up. Can you make this a day or two before and then just heat when needed? I don’t have a crock pot, have you tried baking it in the oven? If so what temperature and how long? My family will be treated to this great sounding recipe tomorrow for the Super Bowl! Thank you! What if i do not have Romano cheese can I use Boursin cheese instead? I think you’d want a cheese more similar to romano or parmesan. boursin seems to be soft and such a different flavor I don’t think it would be a good substitute but it might be a yummy twist on the original recipe. 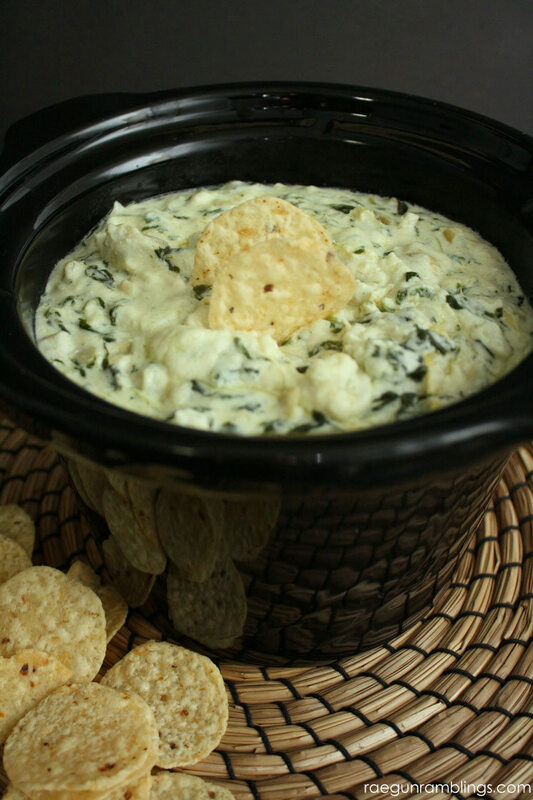 I made this recipe for the super bowl last night and it was great! Everyone loved it! I did tweak it a little to make it a bit healthier. I did not use any butter. I also substituted the sour cream for plain greek yogurt. I also used only one 8 oz. package of cheese, I used a shredded “Italian Blend” that I found at the grocery store. Just a couple ideas for someone looking to make it a little healthier. Thanks for the recipe! Howmany peopleh does his feed? Made this for a Christmas party- used the fast method and it was AMAZING! I didn’t find Romano cheese and I forgot the chilis but it was a hit- definitely a go to for all of the parties coming up! I used only a half stick of butter but will try with no butter next time to be just a bit healthier. May try the greek yogurt suggestion above too- great recipe! This has become my signature dish for parties. I love this recipe – thank you so much for it!! I now add diced hearts of palm to it which adds another level of flavor and texture. I have not tried to but report back if you do! I would imagine it should work. I used fresh spinach and it worked great. yay thanks for the report! Just tried this recipe and I will definitely be making this again! Easy and delicious! I’ve made this probably like 5 times! LOVE IT! Especially NOW that I am doing KETO! Awesome recipe!